On first glance the B 100 wallpaper appears to be a woodgrain design. The knots, woodgrain pattern, and individual planks are all clearly visible. But the ominous gray color makes one stop to reconsider, maybe there is more to this than just a woodgrain pattern. Woodgrain designs, usually printed with earthy colors, impart a warm feeling. 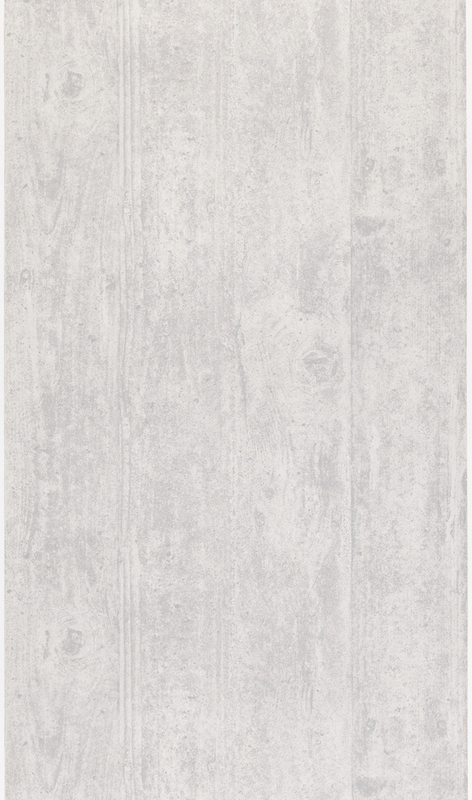 This design, with its cool gray colors and rather scratchy texture, appears very cool, rather the opposite of the woodgrain effect. Closer inspection reveals this may actually be the imprint of a wood form or mold left in fresh concrete. The raised grain of the wood brought about by the moisture in the wet cement is readily apparent. This is strictly conjecture on my part but does seem to fit the character of the Ginbande-Design team. The designers that made up Ginbande-Design, Klaus-Achim Heine and Uwe Fischer, referred to their designs are experiential works as they appear one way on first glance but closer inspection reveals something different. They liked their designs to challenge the observer by creating a little uncertainty. This certainly applies to the B 100, raising doubt whether it is woodgrain or cast cement. I personally like wallpapers that have this effect, appearing one way on first glance then revealing something different upon closer inspection. It keeps the design interesting and gives it some depth. When you’re going to be living with this design on your walls for maybe seven-ten years, that’s important. Wallpapers with woodgrain or faux bois patterns have always been popular. Many of the earliest wallpapers in the museum collection are imitative designs. As this appears to be an imitation of raw concrete it seems to fall under the category of Brutalism, a design movement popular from the 1950s into the 1970s. While Brutalism had largely disappeared by the mid-1980s it has made a resurgence in recent years, though in a somewhat softened, or less brutal, form. Perhaps that explains the impression of the woodgrain in concrete. The viewer sees the grain pattern and automatically thinks wood and warm rather than being immediately struck by the cool effect of the concrete.